Now what do I mean by this term? In recent years March is this month of decent business when studios seem to drop bigger films that are very close to being tentpole Summer Events, but for whatever reason are just a shade short.This goes for big but not that big Animated Films like Ice Age (2002), Monsters vs. Aliens (2009) and How to Train Your Dragon (2010) along with subpar blockbusters like 10,000 BC (2008), Blade II (2002), V for Vendetta (2006) and Knowing (2009). 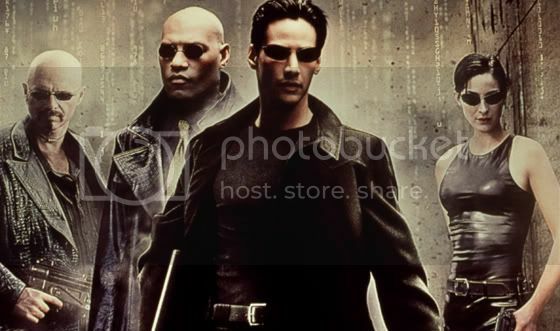 Even something way back like The Matrix (1999) fits this bill, and it blew up huge, later its sequels secured a Summer, then November Release more typical of the Franchise Age. March is like this testing zone for franchises, some of which like Ice Age would be successful and then secure a Huge Summer Release later. Others like Knowing are just awful. Except for that plane scene. So you see it's this month of quasi-good, kind-of big movies. It's not total schlock like January and February but it's not really sure-thing Summer Franchise stuff. Both this year's Battle: Los Angeles (2011) and Rango are perfect examples - risky (by Hollywood standards - read "original") projects that are big enough to possibly earn a buck if not, the studio hasn't wasted a possibly vital Summer Weekend. All this is perfect for Zach Snyder. March is the month of Zach, really. His lifetime only film that hasn't released in March and done reasonably well is that Terrible Random Owl Movie, which wasn't very Snyder-like at all. I mean, not one slow-motion bloody death scene? But anyway, in the past half-decade his flicks have defined March. Dawn of the Dead (2004) virtually launched the current Zombie fad, 300 (2007) came out of no where with Macho Awesome and Watchmen (2009)...had a really cool opening credits scene. Needless to say, his upcoming Sucker Punch (2011) seems to fit that bill nicely, though with this one I don't know he's going to make a cent. More on that in a post next week. But if you're trying to picture the perfect March movie, anything Snyder sums it up nicely. Movies: Zach Snyder (his only film not released in march is that Owl movie), Half-Blockbusters (Halfbusters), it explodes b/c its full of flicks that could be good but not really good enough for a summer release. Same goes with good, bigger kids animated films. Alright, the top weekend for March All-Time belongs to last year's ridiculous Alice in Wonderland (2010) which somehow nabbed $116,101,023 over here before ultimately cracking a $Billion worldwide. I still don't know how that happened. After that we've got some flicks I've mentioned already that have done pretty well, but you'll notice a steep drop-off. Look for yourself. The Top 10 is filled with Halfbusters, most of them Animated Features from unestablished studios or properties that lucked into a good niche. The one exception is probably Wild Hogs (2007) at #9, which was really an awful, awful comedy that was broad enough to warrant a decent release but clearly the declining stock of its principle actors (Travolta, Macy, Lawrence, Allen, etc) made it less of a sure-thing Summer Cash Cow than something like Grown-Ups (2010) (see also the much worse Old Dogs ). Alice in Wonderland's success also let March 2010 charge ahead to become the highest-grossing March Ever. Clocking in at $832,265,884 easily lets March take over January and February's averages (tho January 2010 on the wings of AVABAR  still beats it). You can also see that March works on its average rather than its highball. Besides 2010 and 2007 the highest years haven't really had a recent trend. It's been a consistent month for Halfbusters for some time. Honourable Mentions: There have always been some solid March Comedies like Hot Tub Time Machine (2010), I Love You, Man (2009), Blades of Glory (2007), Starsky & Hutch (2004), Liar Liar (1997) and Tommy Boy (1995). In addition we may add the Halfbusters Hidalgo (2004), Enemy at the Gates (2001) and the underrated Wahlberg flick Shooter (2007). There aren't nearly as many romantic comedies, but the genre influencing Four Weddings and a Funeral (!994) as well as Pretty Woman (1990) were both March Releases. I'm not sure where to put the rest, but for what it's worth the worthwhile The Pacificer (2005), the classic Oscar-Winning Marisa Tomei performance in My Cousin Vinny (1992) and the most insane Horror-Comedy ever, Slither (2006) all found their homes originally in March. You can tell how this is a somewhat experimental month but maybe I should say it's totally risky. Films that come out here usually have a decent chance at a buck but it's more a springboard month for careers in both acting and directing. It's Summer Pre-Season more than anything else; a chance to test the waters, play the rookies, hope for future success. So go see Sucker Punch.